Friend Country Club | We're Not Formal We're Fun! 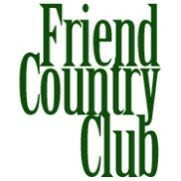 Welcome to the Friend Country Club! Come on out and get to know us, we here at the Friend Country Club love to have FUN! Inside the clubhouse you can have a great dining experience without being dressed to the tee like other country clubs. You can also enjoy the sports bar style atmosphere, with four TVs in our lounge area we can provide a great atmosphere, great food and loads of entertainment . For big events and meetings we have 3 large TV’s that are compatible with your computers for presentations with a microphone also available in the dining area to make sure you can be heard by everyone. NEW!! Golf Academy, Jr. Golf Camps and Jr. Golf League – click here for more information!!! Need something a little more formal? Don’t Worry, we also provide a more formal setting for holidays and other special occasions. Outside you will find one of the best 9 hole golf courses around with challenging roughs, ponds, sand traps, and well maintained greens and fairways at a reasonable price. Have a look around our website and come out and get to know us, we can fill your days and evenings with more FUN than you can imagine!